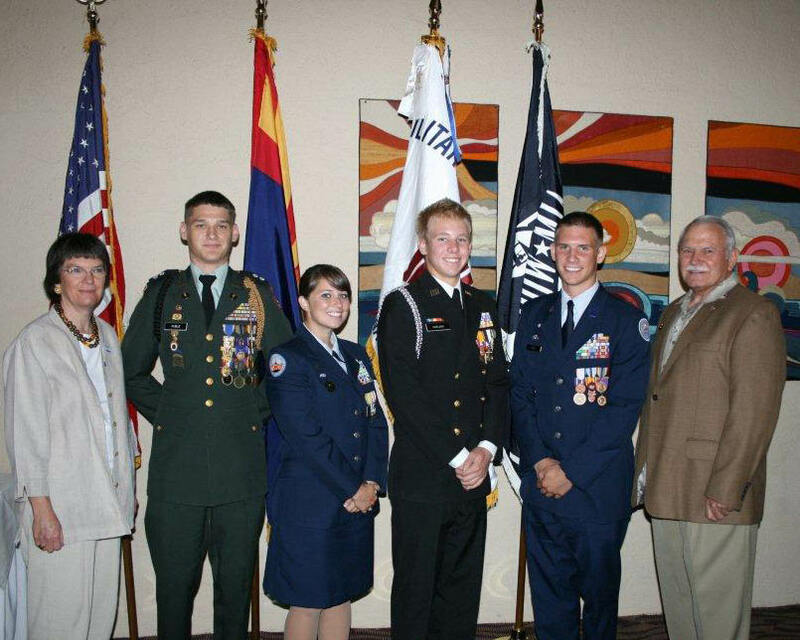 Four JROTC Scholarship awards of $1,000 were presented this year during the Chapter luncheon at McCormick Ranch Golf Course on 16 May 2009. TriWest Healthcare Alliance donated one of the scholarshops. COL Alice Demarais, USA Retired, TriWest’s market vice president for the mountain region, represented TriWest at the presentation. Recipients of this year’s $1,000 JROTC scholarships are, from left: Dustyn Ruble from Alhambra HS Army JROTC, who will attend West Point; Stephanie Butkowski from Cactus HS Air Force JROTC, who will attend Marquette University and plans to be become a military nurse; Andrew Carlson from Cortez HS Navy JROTC, who will attend ASU to major in aerospace engineering, and Kenneth Liles from Deer Valley HS Air Force JROTC, who will attend the U of A and plans to enter the Marines. Also pictured are Col. Alice Demarais of Triwest Healthcare Alliance, and Past President Terry Tassin, who presented the scholarship checks at the May luncheon.